These pages are dedicated to Dave Kenwood G8AJN who championed the DigiLite project but unfortunately became silent key in June 2017. 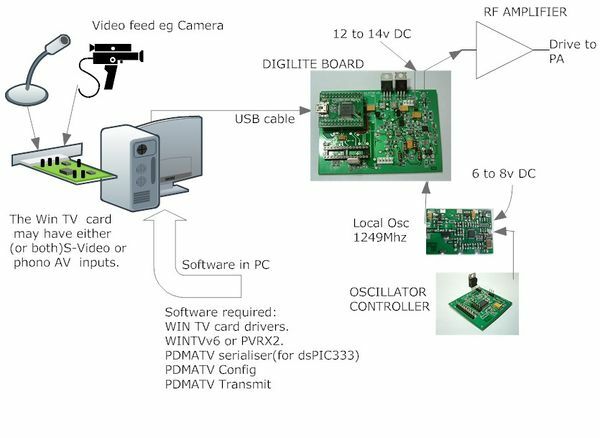 The DigiLite Project was the original system designed by radio amateurs to provide a low cost homebrew method of transmitting live digital TV pictures (DATV). It is a derivative of the “Poor Man's DATV System” which many amateurs have contributed to over several years. The project is no longer under development and not supported - these pages contain the information from Dave's personal web page which has been put here to ensure that the ATV community has access to it in the future. 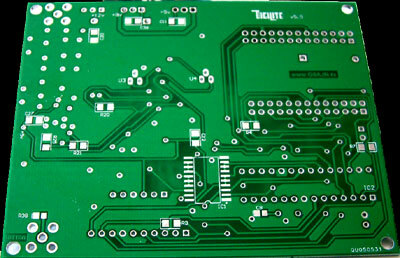 The most recent version of the PCB was 5.9 featuring SMD inductors for the Nyquist Filter a 6 way header for plugging in an optional sub-board with different filter values to suit requirements. (Provision for fixed values to be used on main board instead if preferred). The modulator IC has a ground solder plane to enable the 70cm device with its ground tab to be fitted. GBPVR is a free PVR (personal video recorder) program. Versions up to 1.4.7 have been used successfully. The later version called NextPVR is not suitable. GBPVR requires a certain standard of video graphics card to run, even if you do not actually want to watch the video on that PC. Older graphics card may have problems.There is a setup help page on SOFTWARE sub-page 2. If the file has a .ts tag instead of .mpg you must change settings as you will not get the DigiLite software to use it. DigiLite Transmit is the program that reads the recorded data from hard disk immediately it has been written. The data is in Program Stream format, which is very similar to the format used on DVDs. The video and audio are extracted and converted into DVB-S transport stream format, which is the format used by European broadcasters to deliver standard definition programs via satellite. This means that a cheap FTA (free to air) satellite box may be used to receive the transmission. Other data is placed in the transport stream such as date and time, channel name, program name and EPG info. The transport stream data is sent to the serialiser via a USB port. Config is the program that is used to set the symbol rate and FEC and also the channel name and program details. Settings are stored in the Windows registry, which DigiLite Transmit monitors continually to look for any changes in transmission parameters. This is the device that connects to a high speed (480Mbps) USB 2.0 port and accepts the transport stream data from the PC. . Doing the FEC on the serialiser reduces the data rate over the USB connection.The serialiser has a second communication channel which is used to receive control information from DigiLite Transmit to set the required symbol rate and FEC. The serialiser has been used successfully at symbol rates between 1250k and 6250k. Several symbol rates are pre-programmed into the system. The serialiser board has for an optional SD card socket for playing pre-recorded transport stream files. This function is available on the SD CARD READER page. This must be provided with a signal source at the required transmission frequency. It filters the two digital signals (I and Q) from the serialiser and produces an output at the transmission frequency which can then be amplified and transmitted.Most local oscillators designed to use with digital signals will work, but levels may need to be attenuated by up to 20dB . There is a 3 resistor pi attenuator at the input of the modulator board. There are at least three versions of the cards, download the correct drivers for your version of the card from ... http://www.hauppauge.co.uk/site/support Select: 'Finding your model number' if you are not sure which version you have. If you prefer, the external version PVR USB2 can be used.This can be useful for portable work or with a laptop but it must have USB2 ports. Free if you have an old WinTV install disc in your PC CD Drive at the time Try running WINTV6 first, if it will not record on your pc use a different program GB-PVR: PVR MPEG2 recording software (PVRX2) On the GBPVR download site, click the smaller green button marked DOWNLOAD 15.22MB. The PVRX2 software works well with the DigiLite software. Versions 1.3.11 & 1.4.7 are ok. Later versions like NextPVR seem to work only with later number WINTV boards. This page was last modified on 18 September 2017, at 12:38.